Teaching – Robert D. Byrd Jr., Ph.D.
DRONE journalism flight class, fall 2016. Learning is an interactive process in my classroom. I create an atmosphere where collaborative understanding is created between both student and teacher ensuring the student and the teacher play an important and equal role in education. In other words, all ideas are welcome and appraised, theory is balanced with practice, and students are challenged to achieve excellence. Creating an inclusive and diverse learning experience: In my classroom, students are encouraged to share their experiences and beliefs to further discussion about concepts presented, but they must be prepared to defend their assumptions and ideas. All ideas, including those of the instructor, are subject to questioning. I challenge students to more critically examine issues of race, gender, sexuality, class, ability, and intersectionality not only in the world around them but also in their journalistic endeavors. It is important that students learn to cover these issues in their journalistic work, and to challenge assumptions and representations in the current media environment. I work to create an environment where students must account for the way they write and report on issues regarding communities and people that are often under-represented or misrepresented in media coverage. Theory balanced with practice: In the study of mass communication, learning the skills of the trade is important. However, media practitioners must be armed with both theory and practice to be a productive part of the industry. As such, it is the obligation of a journalism instructor to be thorough in the instruction of the latest in mass communication theory, and at the same time, find innovative ways to guide students in applying theory in a practical way. I want to help train responsible journalists who not only critically examine their own work, but also lend a critical eye to the work of other media professionals. Challenge students to achieve excellence: In my classes, students are respected for individual differences in both learning styles as well as worldviews. I understand students achieve at different levels, and not all students strive for excellence. However, creating an environment where all who seek excellence can achieve it is my first priority. Some of the most memorable and successful academic endeavors are those that present a challenge and leave a lasting impression. My role as the instructor is to facilitate an environment where hard work is demanded and the means to achieve personal goals are provided through my own media expertise. I constantly strive to be a better teacher by assessing my methods and activities in the classroom to aid students in better understanding of the material. It is not enough for me to say I challenge students to become more critical thinkers if I do not myself challenge my previous knowledge and evaluate it with an ever-changing media environment. Each year, semester, and week of class brings new challenges and opportunities to hone my skills as an instructor, but the rewards are great. Pursuing my research interests also inform my teaching methods and material through a sharpening of my critical thinking skills and a knowledge of current media trends. I see my role as an instructor as an opportunity to make an impression on the world and the future of our society. I teach in hopes that my students can pass on the ability to question the world around them, analyze and evaluate the knowledge they possess, and seek answers to meaningful questions. Won the 2018 D. Mike Pennington Award for Mentoring JRSM students. Established website for UofM Multimedia News Lab (journalism capstone class), MemphisMirror.com. The site is focused on covering communities in Memphis that are traditionally not covered by dominant media. In the course, students are asked to cover issues of race, class, gender, sexuality, age, ability, religion, nationality, and intersectionality. The course underwent a major overhaul in my first year at UofM, and each year I’ve made changes to the course to better suit the needs and abilities of our journalism students. Changes made to the course have been met with excitement from students. The site gives some students their first published multimedia clips. Students have also passed portfolio assessment every semester—with the exception of Fall 2016. Changes were made to the in-class portfolio process in the class in Spring 2017 to ensure all students passed assessment standards. So far, that’s been successful. MemphisMirror.com won third place in the 2016 AEJMC Visual Communication Division’s Best of Web Competition. Student writing for MemphisMirror.com have won several SPJ Region 12 and Tennessee AP College awards. Taught the first Drone Journalism course at UofM in Fall 2016. Students learned the basic operation of a drone (DJI Phantom 3 Standard) for journalistic and strategic media use. The students and I completed a training course conducted by a local commercial drone company, 901 Drones. 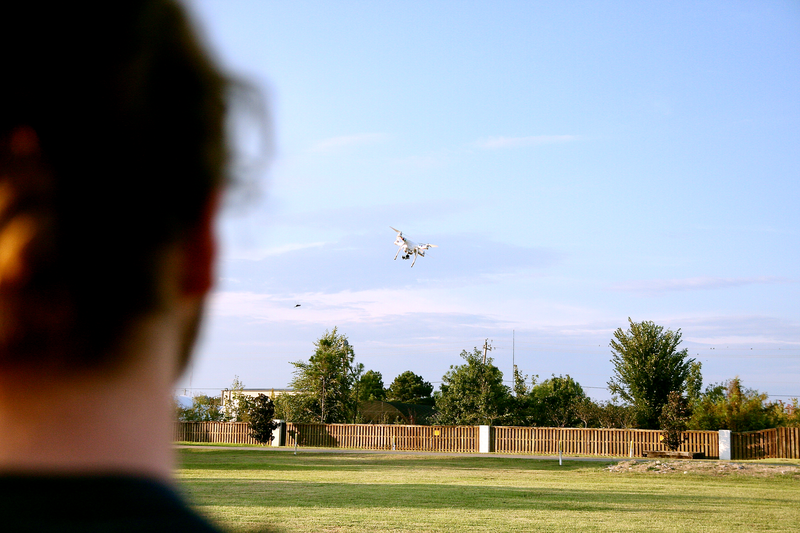 Students produced two media projects using the drone as a means to collect video for clients. Developed a graduate-level multimedia course (JOUR 7350 Advanced Multimedia Journalism) in Spring 2017. Students produced original multimedia content for a website they designed using Adobe Muse, part of the Adobe Creative Cloud. One student, Logan Butts, expanded his project into his graduate capstone experience project, Battle of the Boulevard. Redesigned JOUR 3526 Multimedia Storytelling in Fall 2017. Before Fall 2017, the course was called Digital Imaging. I lead the redesign of the course as the course director. The new focus of provides students with an introduction to elements of photojournalism, audio journalism, data visualization, and video journalism. Students produce several multimedia projects that help them to hone their storytelling abilities. Created and launched a new journalism course JOUR 4180 Public Issues Writing/Reporting in Fall 2017. The seven students in the course produced a five-episode podcast focusing on public transportation in Memphis. MirrorMirror Season One: Public Transportation in Memphis is housed on the MemphisMirror.com site. The multimedia project combines audio journalism with online writing, photo, and data visualization. Developed the online version of JRSM 4702 Media, Diversity and Society. The course is designed in modules that explores media representation of gender, race, ethnicity, sexual identity, age and ability. The addition of online JRSM 4702 allows our online-only students to complete our degree without enrolling in non-university courses. Worked along with other instructors in the journalism department on a multi-class social media project focused on community interactions with local police departments. The collaboration between reporting students and social media management students resulted in more than 400 Instagram posts exploring the Black Lives Matter movement in Memphis, Tennessee. The project resulted in a research collaboration with Prof. Pam Denney, which was presented at the AEJMC National Conference in August 2017. Worked as part of a taskforce to develop a departmental strategy for coverage of the 50thanniversary of Martin Luther King, Jr.’s assassination in April 2018. The plan includes coordinated projects among all journalism courses during the Fall and Spring semesters. Thus far at UofM, my teaching load has consisted of 14 lecture/lab combo course sections—of the 21 total course sections I’ve taught. These courses are heavily focused on doing and producing. My students have produced hundreds of multimedia projects in the last three years. This also means I spend somewhere in the neighborhood of 13 hours each week in the classroom instructing, editing, critiquing, and supervising their progress. I’ve developed or redesigned six courses during my time in the department. Most of the changes work toward the aim of achieving the departmental pillar: multimedia. The changes and additions work toward developing stronger multimedia journalism students. Courses I developed: JOUR 3526 Multimedia Storytelling, JOUR 4180 Public Issues Writing/Reporting, JRSM 4702 M50 Media, Diversity and Society (online), JRSM 7350 Advanced Multimedia Journalism, and JOUR 4802 Drone Journalism. Course I redesigned: JOUR 4998 Multimedia News Lab.